China never ceases to amaze with its usage of QR Codes. Still not aware of China’s love for QR Codes? Read our article on China’s fascination with QR Codes here. Now the latest to join the list is the Hong Kong. The Hong Kong Tourism Board is using QR Codes to help tourists who visit Hong Kong’s business district, Central, explore the city better. The Tourism Board has used some creative QR Codes that help tourists visit hidden treasures in the city. 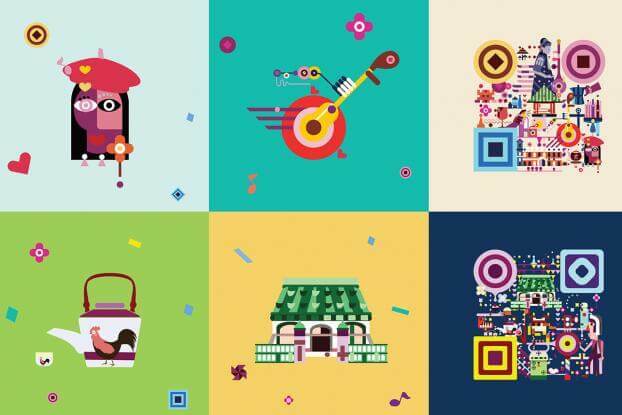 The QR Codes will assist tourists discover galleries, temples, and places that serve the city’s famous street foods. As part of the campaign, the Hong Kong tourism boards has organised four tourists walks-Tasting Hong Kong, Crazy for Art, Treasure Hunt, and Time Traveler. The Time Traveler tourist walk gives visitors a tour of various heritage sites. Each walk has a designated QR Code. The authorities have designed colorful QR Codes to grab the tourists’ attention. Tourists can scan these QR Codes using their smartphones. Scanning the QR Codes will direct the scanner to a webpage with more information on the tourist spots. Though first to use such colorful QR Codes, China is not the only country that has used QR Codes to engage tourists. The QR Codes are undoubtedly unique and visually appealing. The team at Scanova tried scanning the QR Codes, but failed. You and go ahead and give it a try. Let us know about your experience in the comments section below. Also see how cities are going tourist friendly on low budget.